Axis Of Oversteer: Movable Rear wing from 2011! 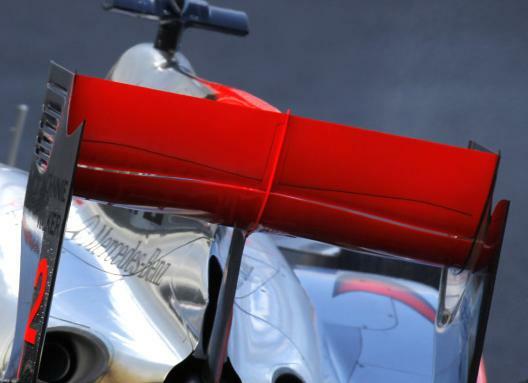 Movable Rear wing from 2011! No F-Duct next season but effectively more of the same. Drivers can now change the angle of the front wing, that should be banned next year in favor of a rear wing that can move some 50 mm, a huge amount in modern aero. The suggestion was made by the FIA technical working group at a meeting in Montreal. "The intriguing twist, designed exclusively to boost overtaking, is that only chasing drivers will be able to adjust their cars' wings. A green light will shine in the cockpit when a car is close enough to the rear of his rival, thereby allowing the driver to trigger the rear wing button." I dislike any idea where only the driver behind can get the advantage. Doesn't seem fair to me. I don't like this new rear wing idea that only following cars can use it, might as well put indicators on each car and a sign "slow moving vehicle please pass".The only time a car should be prevented from using the system would be when it was being lapped. The blue flag should only indicate that you are about to be passed by the lead car. You must stay on the racing line unless the passing car has taken the racing line and you must not slow to allow the following car to pass as you must not be seen to be helping one team against another. If you do, you will be penalised by the stewards. It is up to the following car to pass. The system should only be allowed to be used a certain number of times during the race, those saving its use may be at a greater advantage towards the end of the race.